Yesterday I spent the day in Chania before boarding the 8:30 a.m. bus to Falasarna, one of the westernmost points on Crete. 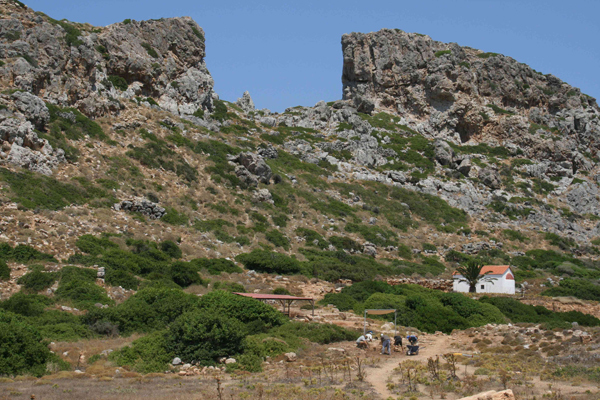 Here, a team under the direction of veteran archaeologist Elpida Hadjidakis has unearthed a â€œclosedâ€ Hellenistic harbor in an unlikely placeâ€”dry land. I caught up with Hadjidakis and the team on the first day of the dig season. The feisty, hands-on excavator, a self-proclaimed â€œharbor girlâ€ who grew up in Chania and Athens, spoke with me as she scrutinized every centimeter of soil unearthed that windy day. The archaeologists (lower center) dig for the continuation of the harbor amid a dramatic landscape. Although they havenâ€™t conducted formal excavations atop the hill behind them, they believe the acropolis of the ancient city was located there. The hillâ€™s central chunk was lost in an as-yet-undetermined cataclysmic event. This entry was posted by Eti Bonn-Muller on Monday, July 27, 2009. Discussion of this blog entry is now closed. 7 comments for "Voyage to Crete: Falasarna"
If you are studying a harbout, get an “old salt” and a builer and ask them when finds might have been located. The idea is that the ancients maybe did not build just by accident but from experience and would have picked certain site for certain construction. Does someone know the signification of “Falasarna” ? Any update on the “fallen tower” that lies at the site? I am not an archeologist but visited in 1997 and was amazed at the potential of this site. I was on this dig in ’91, I think it was. There is an acropolis there. I know we climbed up the rock face to get there. Very steep. It’s an Hellenistic period site. The entire western part of Crete was lifted out of the ocean a few meters over time due to earthquakes and/or plate techtonics. Very remote. Would love to go back some day. Just wondering if the dig is still continuing? and how it is going? The comments on site are all dated 2009 and I wondered what progress had been made? What is required to be part of the dig? how to get there? rules that apply? any time frame for staying? nearby accommodation?